Main interest is focused on the fundamentals of technological applications, such as dense ceramic membranes reactor for the effective utilization of nature gas (methane) and thermal decomposition of carbon dioxide. Essential to the research is the development of novel mixed-conducting material (with both high oxygen permeation flux and structural stability) and a fundamental understanding of the relationships between material characteristics, such as crystal structure, composition, defect chemistry and microstructure, and material properties related to diffusion of ionic and electronic species. Jiawei Zhu, Ziye Dong, Zhengkun Liu, Kai Zhang, Guangru Zhang, Wanqin Jin*, Multichannel mixed-conducting hollow fiber membranes for oxygen separation, AlChE J., 60 (6):1969-1976 (2014). Wei Jiang, Guangru Zhang, Zhengkun Liu, Kai Zhang, Wanqin Jin*, A novel porous-dense dual-layer composite membrane reactor with long-term stability, AlChE J., 59:4355-4363 (2013). Kai Zhang, Guangru Zhang, Zhengkun Liu, Jiawei Zhu, Na Zhu, WanqinJin*, Enhanced stability of membrane reactor for thermal decomposition of CO2 via porous-dense-porous triple-layer composite membrane. Journal of Membrane Science, 471:9–15(2014). Research is mainly focused on the development of organic-inorganic composite membranes, which generally include two types: inorganic substrate-supported polymer composite membranes and inorganic fillers incorporated polymeric mixed matrix membranes. Materials characteristics, free volumes and interfacial morphologies of the composite membranes are tailored for efficient molecular-level separation (e.g., pervaporation, gas separation). In particular, large-scale production and industrial application of the organic-inorganic composite membranes are studied to implementing membrane technology in the fields of bio-fuels production, VOCs treatment, CO2 capture, oxygen enrichment, etc. Ziye Dong, Gongping Liu, Sainan Liu, Zhengkun Liu, Wanqin Jin*. High performance ceramic hollow fiber supported PDMS composite pervaporation membrane for bio-butanol recovery, J. Membr. Sci., 450:38-47 (2014). Sainan Liu, Gongping Liu, Xuhong Zhao, Wanqin Jin*. Hydrophobic-ZIF-71 filled PEBA mixed matrix membranes for recovery of biobutanol via pervaporation, J. Membr. Sci., 446: 181-188 (2013). Gongping Liu, Wang Wei, Hao Wu, Xueliang Dong, Min Jiang and Wanqin Jin*, Pervaporation performance of PDMS/ceramic composite membrane in acetone butanol ethanol (ABE) fermentation-PV coupled process, J. Membr. Sci., 373: 121-129 (2011). 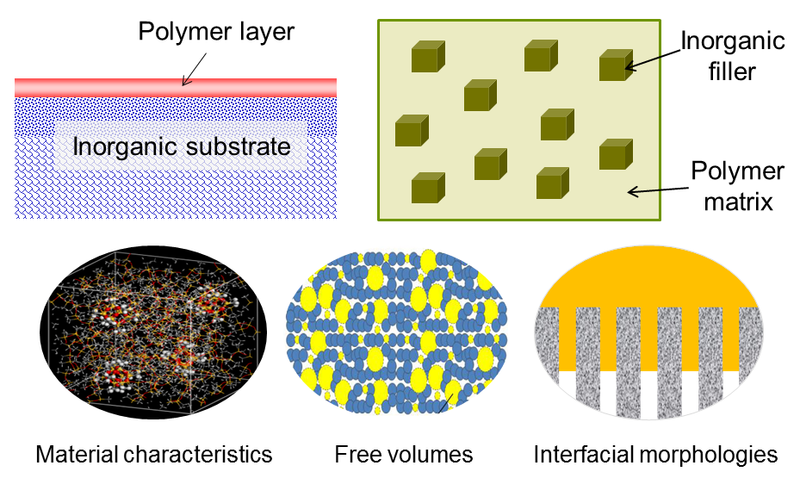 Wang Wei, Shanshan Xia, Gongping Liu, Xuehong Gu, Wanqin Jin*, Nanping, Xu, Interfacial adhesion between polymer separation layer and ceramic support for composite membrane, AIChE J., 56: 1584-1592 (2010). Fenjuan Xiang li, Yiwei Chen, Wanqin Jin*, Nanping Xu, PDMS/ceramic composite membrane with high flux for pervaporation of ethanol-water mixtures, Ind. Eng. Chem. Res., 46: 2224-2230 (2007). Novel materials, such as graphene and metal-organic frameworks (MOFs), have attracted increasing attention in recent years. Our main works are devoted to fabricate integrated graphene-based and MOFs membranes, which serve as barriers for the selective permeation of mixture components (gas mixture or liquid mixture). Kang Huang, Gongping Liu, Yueyun Lou, Ziye Dong, Jie Shen, Wanqin Jin*. A Graphene Oxide Membrane with Highly Selective Molecular Separation of Aqueous Organic Solution, Angewandte Chemie International Edition, 2014, 53, 6929 –6932. Kang Huang, Xueliang Dong, Rufei Ren, Wanqin Jin*, Fabrication of homochiral metal-organic framework membrane for enantioseparation of racemic diols, AlChE J., 59(11): 4364-4372 (2013). Kang Huang, Ziye Dong, Qianqian Lia and Wanqin Jin*. Growth of a ZIF-8 membrane on the inner-surface of a ceramic hollow fiber via cycling precursors, Commun., 49: 10326-10328 (2013). Wenjin Wang , Xueliang Dong , Jiangpu Nan , Wanqin Jin* , Zhongqiao Hu , Yifei Chen, Jianwen Jiang, A homochiral metal-organic framework membrane for enantioselective separation, Commun., 48:6989-7104 (2012) (Inside Cover). Jiangpu Nan, Xueliang Dong, Wenjin Wang, Wanqin Jin* and Nanping Xu, Step-by-Step Seeding Procedure for Preparing HKUST-1 Membrane on Porous r-Alumina Support, Langmuir, 27: 4309-4312 (2011). 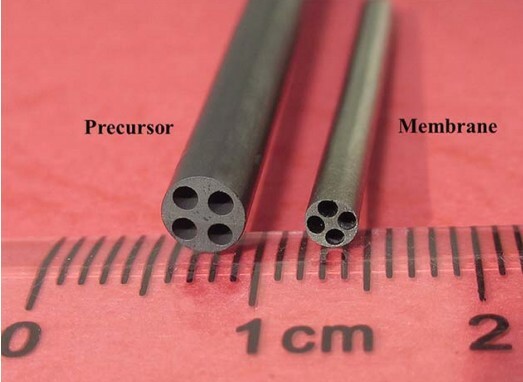 Porous ceramic membrane reactors have attracted considerable attention from both the academic and industrial communities in recent years because of they offer the capability of nano-size solid catalysts separation and gas/liquid reactants dispersion in heterogeneous catalysis. We have developed three main porous ceramic membrane reactor configurations: (a) side-stream membrane reactor, (b) submerged membrane reactor and (c) loop membrane reactor, and the major considerations for the porous ceramic membrane reactors, i.e. the application-oriented ceramic membrane design, the optimization of ceramic membrane reactor performance and the membrane fouling control are systematically studied by experimental investigation, mathematical modeling and CFD simulation. Lie Meng, Hongze Guo, Ziye Dong, Hong Jiang, Weihong Xing, Wanqin Jin*, Ceramic Hollow Fiber Membrane Distributor for Heterogeneous Catalysis: Effect of membrane structure and operating conditions, Eng. J., 223, 356-363 (2013). Hong Jiang, Lie Meng, Rizhi Chen, Wanqin Jin*, Weihong Xing, Nanping Xu, Progress on Porous Ceramic Membrane Reactors for Heterogeneous Catalysis, J. Chem. Eng., 21(2), 205-215 (2013). Lie Meng, Jingcai Cheng, Hong Jiang, Cao Yang, Weihong Xing, Wanqin Jin*, Nanping Xu, Computational Fluid Dynamics-based Design and Optimization for Submerged Membrane Reactor, Eng. Technol., 36(11), 1874-1882 (2013). Hong Jiang, Lie Meng, Rizhi Chen, Wanqin Jin*, Weihong Xing, Nanping Xu, A Novel Dual-Membrane Reactor for Continuous Heterogeneous Oxidation Catalysis, Eng. Chem. Res., 50: 10458-10464 (2011). Changjuan Lu, Rizhi Chen, Weihong Xing, Wanqin jin*, Nanping Xu, A Surmerged Membrane Reactor for Continuous Phenol Hydroxylation Over TS-1, AIChE J., 54: 1842-1849 (2008). Our interests on biosensor research are mainly focused on the development of novel biosensing materials and nanostructure control methods to obtain high performance biosensors for the analysis of physiological activator and DNA. (1)Development of novel preparation approaches, e.g. self-assembly (SA), aerosol deposition, electro-field SA and template SA methods, for the nanostructure growth of biosensing films. (2)Advanced materials application in the fabrication of ultrasensitive biosensor. 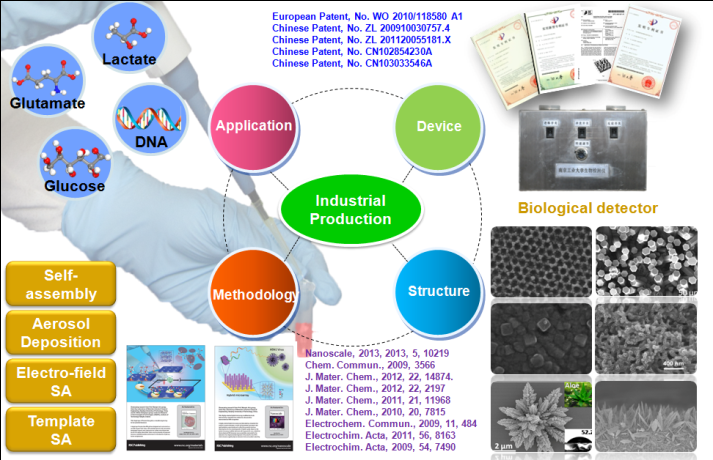 (3)Large scale construction and production of biosensor chips and devices. Lei Shi, Zhenyu Chu, Yu Liu, Wanqin Jin*, Xiaojun Chen. 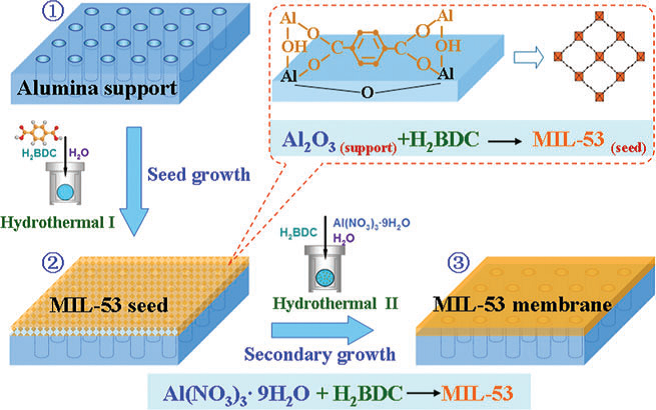 An ultrasensitive electrochemical sensing platform for Hg2+ based on a density controllable metal-organic hybrid microarray, Bioelectron., 54: 165–170 (2014). Lei Shi, Zhenyu Chu, Yu Liu, Jingmeng Peng, Wanqin Jin*. Three-dimensional porous microarray of gold modified electrode for ultrasensitive and simultaneous assay of various cancer biomarkers, Journal of Materials Chemistry B, 2: 2658-2665 (2014). Zhengyu Chu, Lei Shi, Yu Liu, Wanqin Jin*, Nanping Xu, In-situ growth of micro-cubic Prussian blue-TiO2 composite film as a highly sensitive H2O2 sensor by aerosol co-deposition approach, Bioelectron., 47: 329-334 (2013). Lei Shi, Zhenyu Chu, Yu Liu, Wanqin Jin*, Xiaojun Chen, Facile synthesis of hierarchically aloe-like gold micro/nanostructures for ultrasensitive DNA recognition, Bioelectron., 49: 184-91 (2013). Lei Shi, Zhenyu Chu, Xueliang Dong, Wanqin Jin* and Eithne Dempsey. Highly-oriented hybrid microarray modified electrode fabricated by a template-free method for ultrasensitive electrochemical DNA recognition, Nanoscale, 5 (21) : 10219-10225 (2013). 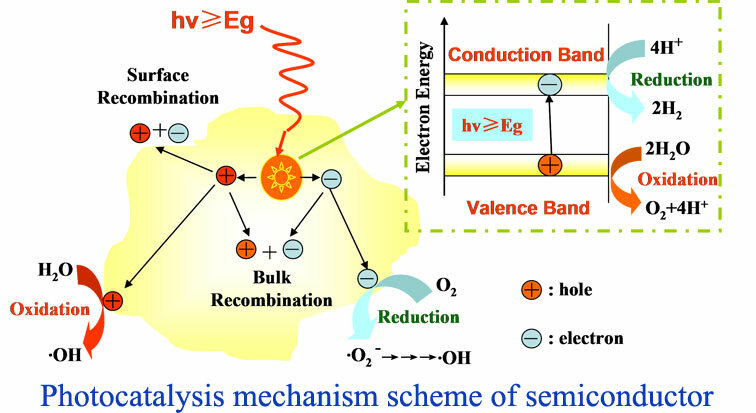 Youping Cheng, Hongqi Sun, Wanqin Jin,and Nanping Xu,”Effect of preparation conditions on visible photocatalytic activity of titania synthesized by solution combustion method”,Chinese J.Chem.Eng.,15:178-183(2007). Youping Cheng,Hongqi Sun,Wanqin Jin,and Nanping Xu,”Photocatalytic degradation of 4-chlorophenol with combustion synthesized TiO2 under visible light irradiation”,Chem.Eng.J,128:127-133(2007). Sun Hongqi, BaiYuan, Liu Huijing, Jin Wanqin, Xu Nanping, Photocatalytic Decomposition of 4-chlorophenol over an Efficient N-doped TiO2 under Sunlight Irradiation, J Photochem Photobiol A,201(1):15-22(2009). Hongqi Sun, Yuan Bai, Youping Cheng, Wanqin Jin, Nanping Xu.”Preparation and Characterization of Visible-Light-Driven Carbon-Sulfur-Codoped TiO2 Photocatalysts”Ind.Eng.Chem.Res.,45:4971-4976(2006).